It is believed that masking is an effective countermeasure against power analysis attacks: before a certain operation involving a key is performed in a cryptographic chip, the input to this operation is combined with a random value. This has to prevent leaking information since the input to the operation is random. We show that this belief might be wrong. We present a Hamming weight attack on an addition operation. It works with random inputs to the addition circuit, hence masking even helps in the case when we cannot control the plaintext. It can be applied to any round of the encryption. Even with moderate accuracy of measuring power consumption it determines explicitly subkey bits. The attack combines the classical power analysis (over Hamming weight) with the strategy of the saturation attack performed using a random sample. We conclude that implementing addition in cryptographic devices must be done very carefully as it might leak secret keys used for encryption. In particular, the simple key schedule of certain algorithms (such as IDEA and Twofish) combined with the usage of addition might be a serious danger. 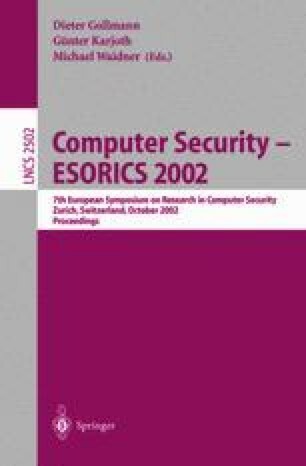 Burwick C., Coppersmith D., D’Avignon E., Gennaro R., Halevi S., Jutla C., Matyas S., O’Connor L., Peyravian M., Safford D., Zunic N., MARS — A Candidate Cipher for AES, http://www.research.ibm.com/security/mars.html. Daemen J., Rijmen V., The block cipher Rijndael, http://www.esat.kuleuven.ac.be/~rijmen/rijndael. Lucks S., The saturation attack-a bait for Twofish, http://eprint.iacr.org/2000/046/. Rivest R., Robshaw M., Sidney R., The RC6 Block Cipher, http://theory.lcs.mit.edu/~rivest/rc6.ps. AES Development Effort, NIST, http://www.nist.gov/aes.